Though I may not be entirely impartial, I can honestly say that Twelfth Night was a great success. Not only was it brilliant, but it was one of the best experiences of my university life. Thank you to everyone who came to watch, and for those who had the great misfortune to miss it, you can weep piteously over these photos. Don’t worry, you’ll get over it some day. 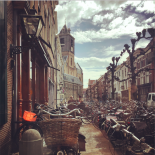 This entry was posted on December 12, 2012 by admin@theleidener in Anna, Culture.